I've completed almost half of my January OMG, to make two cat mats for the Humane Society. Here is a tutorial for this fun and quick make. This is what we are making, in the RSC2018 colour of the month, pale blue. It measures about 18" wide by 12" high. You could use this same pattern to make placemats. For the large squares, cut 12 squares @ 3.5"
for the 4-patches, cut two strips @ 2" wide of two different fabrics for a total of 4 strips. You will have extra. 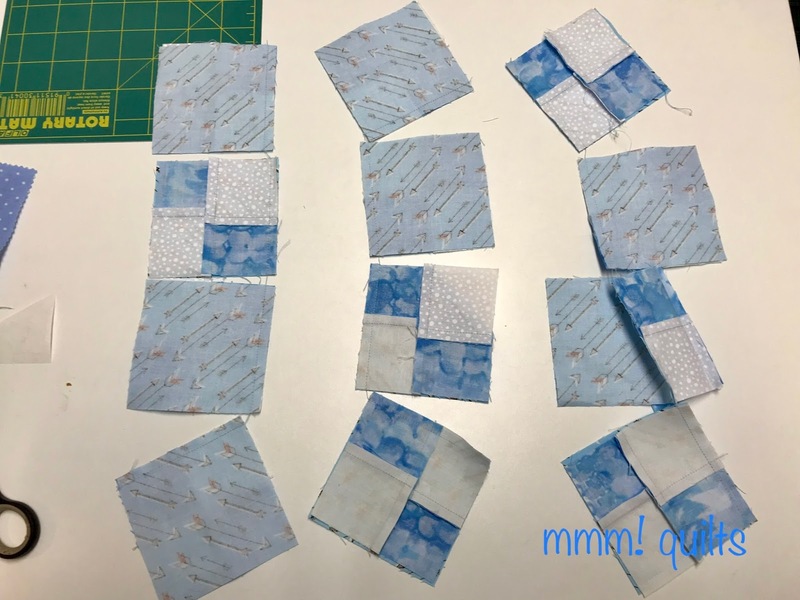 You actually only need one WOF strip and another about 10-12" long from each of the two fabrics, if working with scraps. Sew two strips of the 2" contrasting fabrics together along the long edge of the strip. Press to the darker fabric. This will help 'nest' the seams (making a nice match at the centre). Repeat with the second two strips. Cut 24 @ 2" wide segments from these strips. Pair these, nesting the seams at the centre of each 4-patch, to make 12 4-patch blocks. They should measure 3.5" square. Arrange in alternating fashion to make a 6 X 4 block rectangle as shown below. Double-check (clearly I didn't; see the error?!) your design. Visualize these 6 columns as 3 sets of 2. Pair the blocks in the first column and chain sew them together. Repeat with the middle set, and finally with the third set. 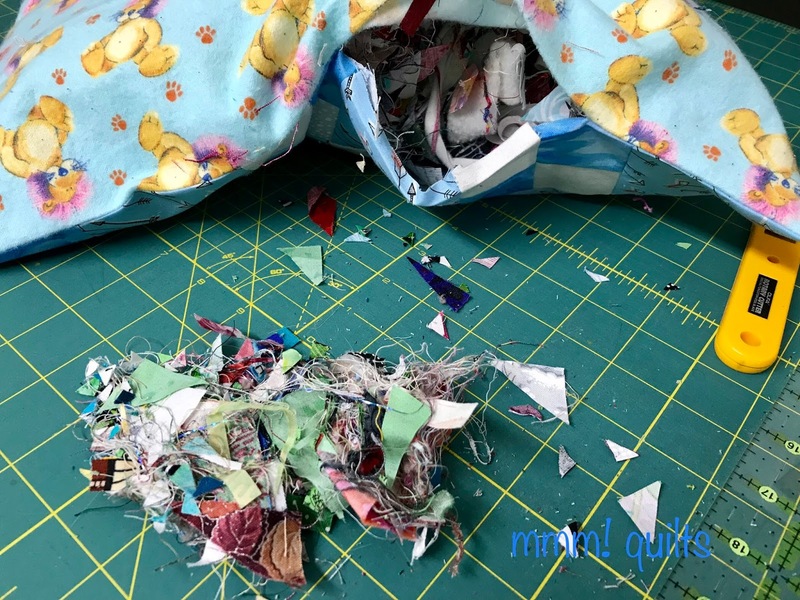 I piece the majority of my quilts this way, in columns, a method I call "Book it!" which is in more detail here. 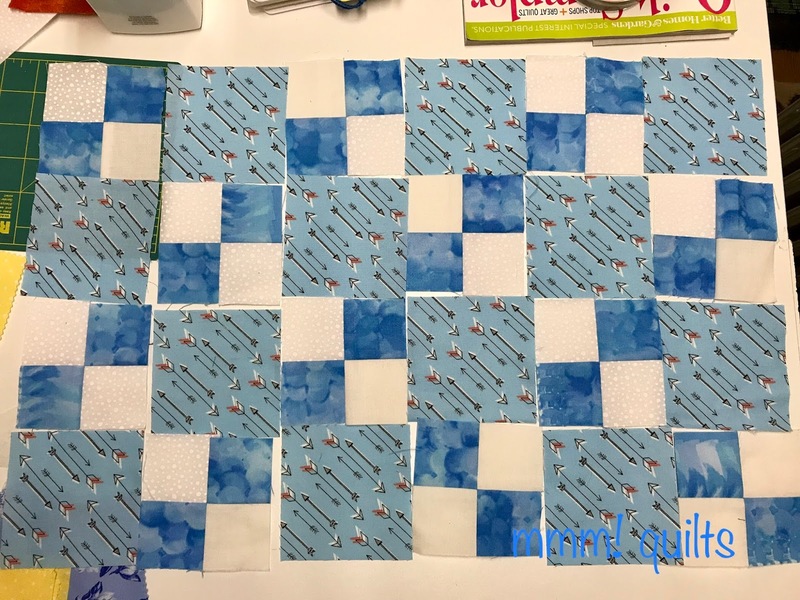 I learned it many years ago in a colourwash class, where it was invaluable in keeping a few hundred 2" squares in exact order as you'd arranged on your design wall! Press in alternating directions. I've turned the columns sideways to fit on my small pressing board. Putting the 3.5" squares on top, alternating down the column, as you see in the bottom of the picture, ensures the pairs get pressed to those 3.5" squares. The alternating pressing scheme again will help nest all your seams. 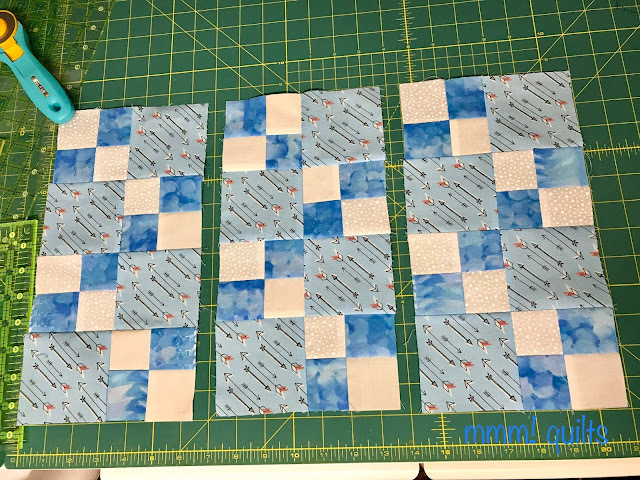 Sew the top pair to the pair below it, and so on down the column until you have the entire column (a 2 block by 4 block column) pieced. Repeat with the other two columns. Press columns 1 and 3 seams down, and column 2 seams up. 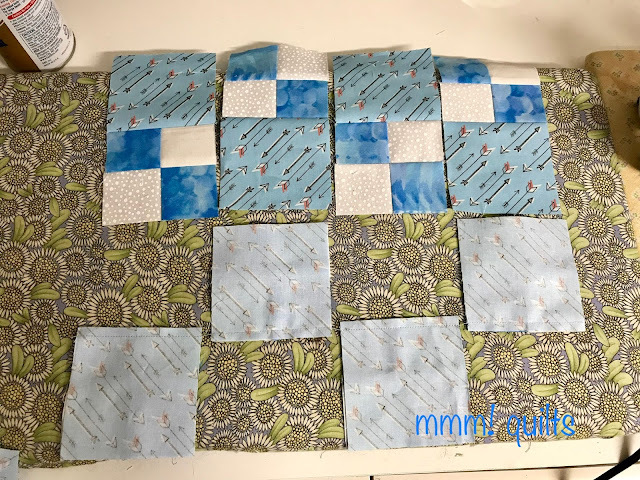 Sew all three columns together, and press! And THAT was when I noticed... Sigh. But as you see from the top photo, I unpicked and fixed it. Can't have a kitty bum on a mat with an error! I have to quilt it up yet, but I'll show you when I have the other one all done, which needs to happen by January 31. Bella tried it out for size, with some coaxing...😼 any other time she's all over something I'm trying to photograph! All right, lots to do before we leave, in the sewing loft that is. Ha! Priorities. Not much else to worry about, all quick and easy. Job one is Wayward Transparency; it is done but for the binding. Job three is writing up a finish post for another quilt coming out in Benartex's Modern By the Yard magazine which goes live on Friday. EEEP! I just quilt, slowly, because it's very thick, two lines, so the mat is divided into three sections. Then one more lengthwise down the centre. More detail when I get the other one done. Love that arrow print. 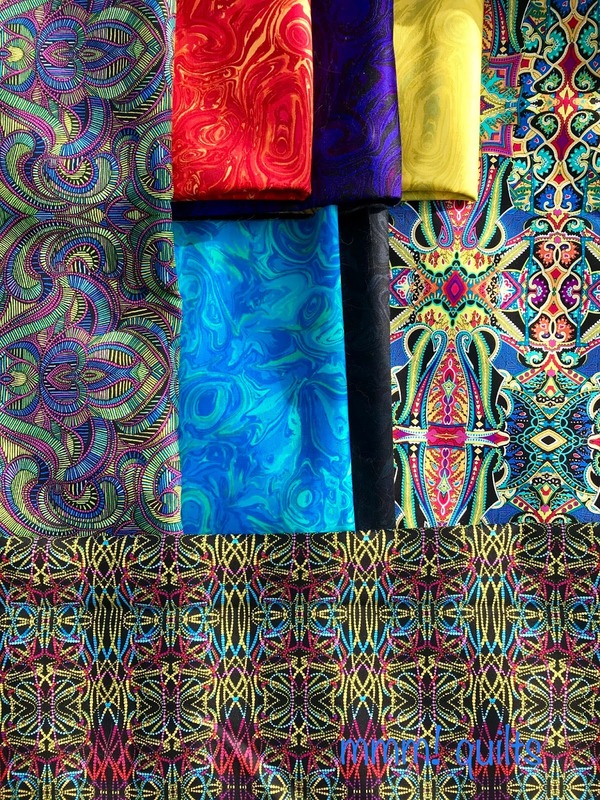 Can't wait to see what you make with those gorgeous fabrics. Nice cat mats but I don't have a cat any more, sad. I do have two wild dogs who chew holes in my quilts and cushions given half the chance though, even sadder :-( Good luck finishing Wayward Transparency and planning what to do with those gorgeous fabrics. I can see why you are drooling, those fabrics are lovely! 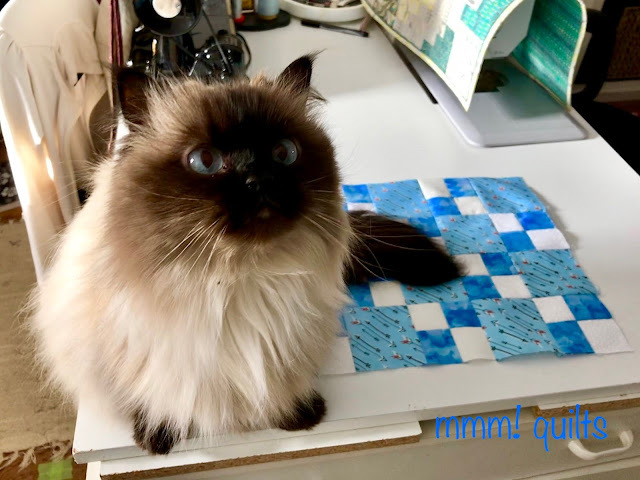 Love the blues in you cat mats! Very fun kitty mat. I really like the arrow fabric with how the arrows are on a diagonal. Thanks for the cat mat tutorial! I'm curious to see the next steps, whether you do binding or "pillowcase" style finishing. Your kitty is soooo gorgeous! What a fun little tutorial. 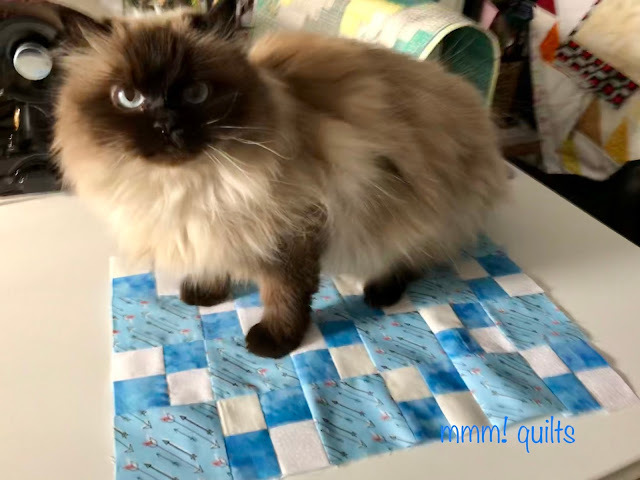 I probably should make one, since Max thinks any small mini quilt or runner is his to nap on! Maybe having his own would be just the thing. I love Bella's face in the first picture; she doesn't look too amused! You are one busy lady, but you sound happy with all that going on, so that's good! Poor Bella. She was just worried that if she sat on the mat she would be up for adoption. :) You should have appealed to her cat vanity and told her how it complemented her eyes. lol. Very nice project. Kitty approved! As always, you’ve inspired me. Today’s the day! Good luck accomplishing your three 'jobs'! How exciting to be in the MBTY magazine! And to be looking forward to your trip! Yay! Fun tutorial. Looks like you've been busy this month. 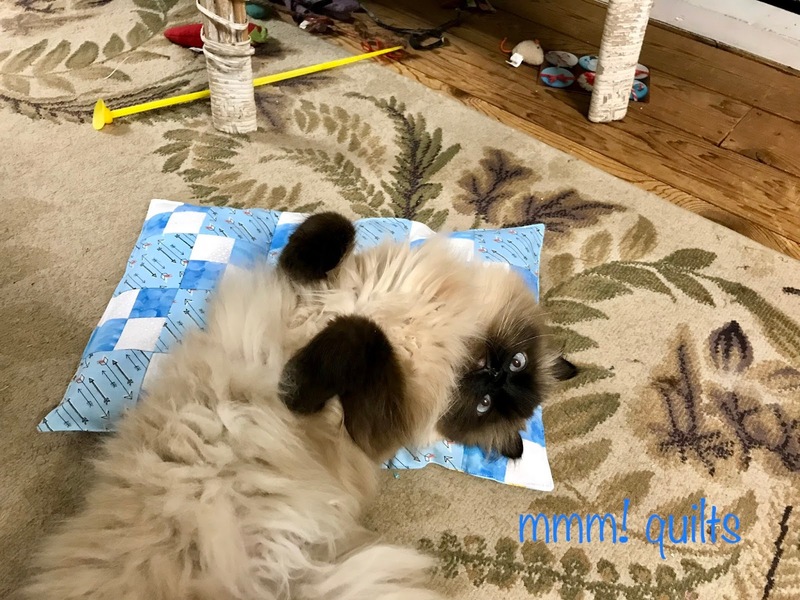 Your kitty mats are such a great idea! I have some orphan blocks that look like your blocks (the double 4 patches) and they would work perfectly for making some. I'm going to keep that in mind! You are lucky getting to work with that beautiful Benartex fabric! 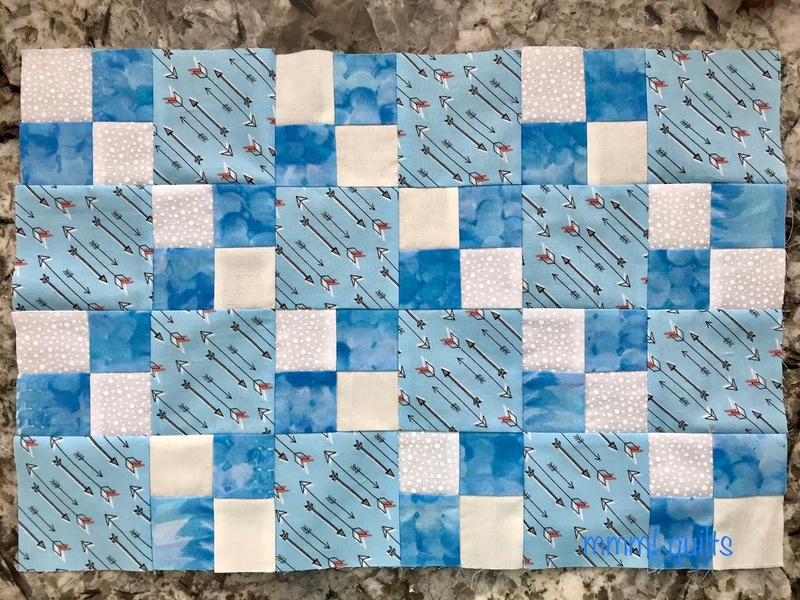 I like the plus quilt you designed for the Benartex magazine. Plus quilts often look so intense and crowded, but all your empty space makes an enormous difference. What a nice project to donate. Lots of happy kitties!